HOT DEALS: Sevenoaks Sound & Vision sale ends February 7 | What Hi-Fi? There are still some hot deals to be had, including a Pioneer PDP-LX5090 plasma for £1799 (was £1999) with five-year guarantee. Want to add surround sound to your system? Then if you buy any Yamaha, Onkyo, Denon or Pioneer multichannel amp/receiver you'll qualify for up to 33 per cent discount on the speakers of your choice. You can also get 25 per cent off the Onkyo AV receiver range. 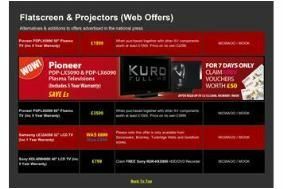 And if it's a big-screen picture you're after, there's up to 25 per cent off a projector screen if you buy any projector from JVC, InFocus, and SIM2. Ideal for partnering with a quality Blu-ray player, such as Denon's DVD-2500BT Blu-ray transport, on sale for £799 (was £899). And music lovers can pick up a Denon D-M37 DAB micro system with Monitor Audio Bronze BR1 speakers for £299, or qualify for up to 33 per cent off the speakers of your choice if you pay full retail for any hi-fi separates from Arcam Cyrus, Marantz or Roksan. Hurry while stocks last.